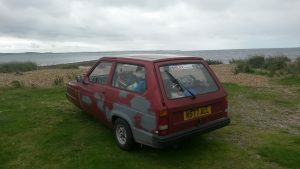 Late last month a friend and I set off on a 1500 mile pilgrimage, in a Reliant Robin, to the home of Scottish whisky – Islay. 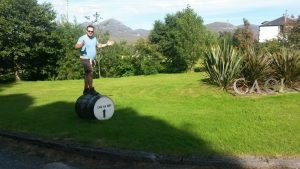 Having managed to visit all 8 distilleries on the island, here is a brief account of our adventures plus a personal reflection on the best Islay has to offer. 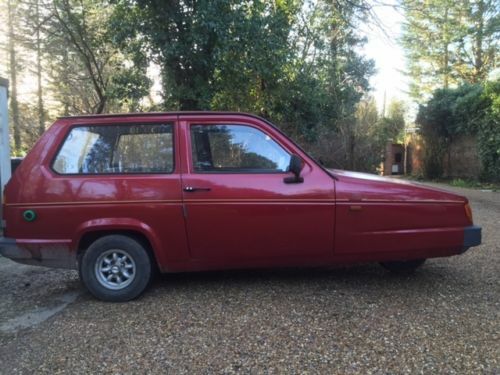 Your first question might be… why a Reliant Robin. M y response would be ‘why not’. If your travelling the length of Britain on a road trip then why not choose a classic icon of British motoring. Tony and I had (somehow) negotiated a week away from the wives and children to fulfil a real bucket-list ambition. We set off on the Friday evening with the plan of wild camping the whole week (wild camping being in a tent without organised campsites and other such luxuries). We gave ourselves plenty of time, in case the 30 year old car struggled with the mileage, as our ferry left from the port of Kennacraig at 6pm on the Saturday. We made great progress, slept briefly in some guys field and were awoken to the sound of shotgun fire at around 6am. Not wishing to pick buckshot from Tony’s behind for the remainder of our journey we decided to scratch our camp in a hurry and scarper. Luckily, when on the island, people were far happier for us to camp wherever we wanted. The second leg of our route saw us pass Loch Lomond and Loch Fyne both of which feature some of the most beautiful scenery I have ever witnessed. We made the ferry in excellent time and took the two and a half hour crossing in comfort. I have to say that the Caledonian MacBrayne ferries are rather nice and the customer service is exceptional. Being from the South East of England I am always taken aback, when venturing beyond the Watford Gap, by how pleasant people can be. The island itself is just 25 miles long by 15 miles wide and so it is somewhat interesting to think of there being no less than 8 whisky producers in such close proximity to each other. We arrived on the island at around 8pm. It was still light and so we set off to find our first camp. Having no local knowledge we naively scanned a map on the ferry and decided that we would head to a large stretch of wilderness called The Oa. This whole area turned out to be a bog requiring the Robin to undertake some serious off-roading. We headed back to civilisation. Darkness quickly engulfed us and we drove around aimlessly for 2 hours before, more by luck than judgement, we stumbled across a place at which a number of caravans had pulled up. That was good enough for us. We pitched our tents in the dark, set a quick fire, wolfed down down some barely cooked burgers and slept like babies. When morning came I peered out of my tent to see that we had stopped by a small stony beach with a red sun rising over the water. What a wonderful way to wake up. Over the coming days we got to grips with the terrain on the island and set to camping close to a number distilleries and then walking to them. We quickly got into a rhythm of seeking a new camp in the morning and visiting distilleries in the afternoon before cooking on an open fire and watching the stars in the evening. Here is my personal view of the distilleries and their general hospitality. I have tried to put them in order from my favourite to my least favourite…because in reality I enjoyed them all. We took the basic tour at Laphroaig which, like all of the distilleries, this consisted of a walk around the facilities, looking at the stills and a talk about their history. The basic cost at Laphroaig was £6. We arrived at around 12pm, the tour was 45 minutes and we left just after 4pm. Needless to say while the lady behind the bar was plying us with free samples we were going nowhere. I contest that that day I spent the best £6 of my life. However, when we were given a bottle of water each and told to come back tomorrow we felt our welcome had been worn out. For me, Laphroaig make the best whisky and strangely, having sampled the whole range, their standard 10 year old is still my favourate. Again, we did the tour at a cost of £5 and spend the whole afternoon there. There visitors centre is extremely comfortable and informal and has by far the nicest atmosphere. Again, after ‘sampling’ their whole range a couple of times we were politely told ‘gentlemen, this is not a pub’ and so we took our leave. A real highlight of of this distillery, and possibly the whole trip, were their range of super peaty whiskies called Oxtomore. At nearly 64% it is a fiery tipple but absolutely fantastic. In my weakened state I very nearly parted with the hefty £300 for a bottle but thankfully Tony pulled me away before I could get my credit card out. If there is one distillery that you are likely to miss it would be Kilchoman. It is a bit off the beaten track but to my mind, it is the most honest. It is not as glitzy and not as well set up for visitors as some of the others but still well worth a visit. It is the only distillery on the island still owned by islanders and not a big corporation. In fact, we happened to bump into one of the of sons of the owners who was kind enough to give us a personal tour. 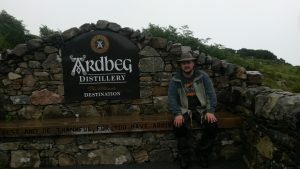 Ardbeg is located on a massive site and very accommodating. However, they seem to have put their focus into creating a restaurant feel, which is a little off-putting. However, their whiskies are fantastic and they remain well worth a visit. Located in the small town of Bowmore the visitor centre is very slick. A modern white-walled and glass affair with a modernist water feature in the entrance. It was a little too polished for me but the staff were wonderful. Caol Ila has a tiny visitor centre which is distinctly uncomfortable. Situated in an 1970’s monstrosity of the building the tour shows an operation more industrial in nature that the rest. However, if you look beyond the building, it is set (like a bond villains layer) in a stunning cove on a beach overlooking a wonderful view. Surprisingly I found the whisky to be a tad disappointing but then I suppose we had been spoilt over the preceding few days. 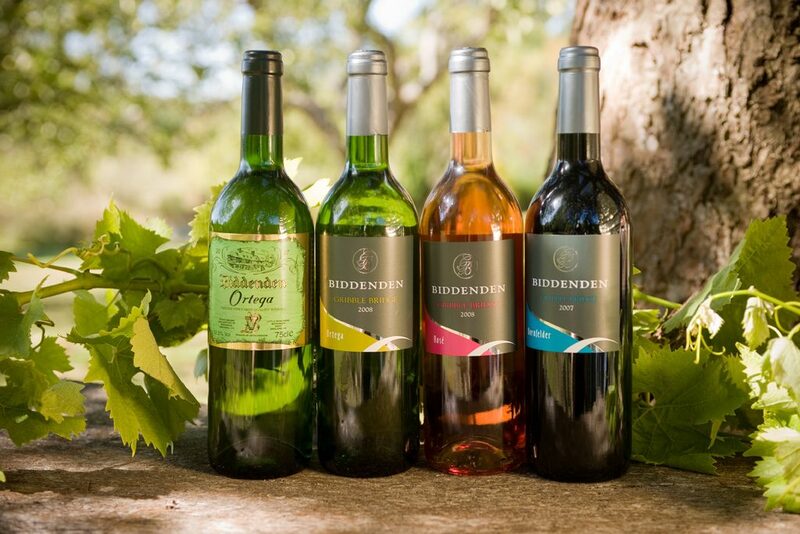 This distillery is a real trek and when you arrive is very different from the others. It feels like a Victorian prison/workhouse with it’s imposing grey buildings encircling a large courtyard. It felt like the visitor experience was very much an afterthought and the whiskey was, to my taste, pretty awful. Along with Laphroaig and Ardbeg, Lagavaulin are on a recently constructed distillery walking route. This makes access to and from the sites extremely easy. The whole route is about a 5 mile round trip with the final mile feeling like reaching the summit of Everest. 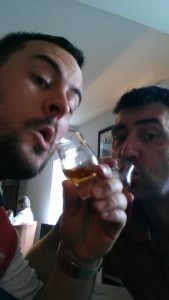 However, Lagavaulin provided a very disappointing visitor experience. While their visitor centre is decorated in a charming colonial style, the staff seem tainted by disillusionment. Without exception, all of the other distillery staff had been welcoming and extremely passionate about the product but here it felt the fire had long been exhausted. While Lagavaulin might be one of the best known brands, their whiskey was also not up to the standard of the others. We arrived in their 200 anniversary year expecting a jubilant atmosphere and were sorely disappointed. We were also given a sample of their special anniversary bottling… which was awful. So, after 5 days, 8 distilleries and countless drams it was time to leave the island. We were welcome, we saw some of the most stunning views possible anywhere in the world and were truly spent. Our journey back in our trusty Reliant was less eventful that our arrival, our mission to simply eat up the miles. We pushed the Robin to it’s limits and made home in less than 9 hours of almost solid driving. We had a absolutely wonderful time but the real star of the show was the trusty Robin Reliant who defied it’s doubters to make the whole journey without missing a beat. Everywhere we went the plucky little car was met with smiles and waves. We attained, by virtue of the car, celebrity status on the island and I am sure that contributed to peoples pleasantness to us. It is however telling that, as soon as we reached Essex we were immediately met by, on more than one occasion, a number of white van men hanging out of their windows imitating the milking of cows and calling us bankers (or something to that effect). Welcome home, I though to myself. Is the reputation of British business being sullied by a greedy few? The bogeyman of British business? 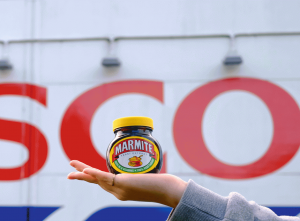 It is clear that Britain currently holds a special place in the international consumer market. By many countries we are seen as the gold standard in quality and business leadership. 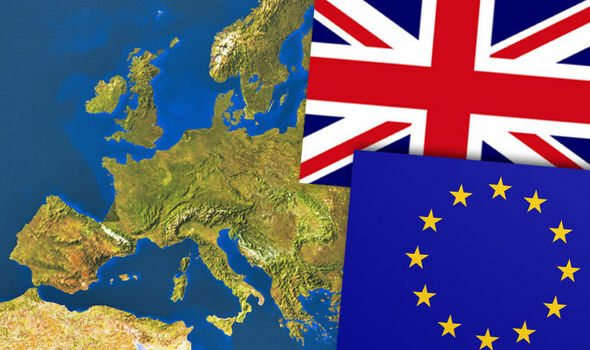 However, it has been a challenging time for British business in recent months and it makes me wonder if the actions of a greedy few might be tarnishing the once sparking gilt of Brand Britannia? Two of the nation’s most prominent retail bosses, in a relatively short space of time, have been the subject of a very public flogging by Select Committees for their mis-conducts, putting the spotlight firmly on business standards in Britain. Firstly, Sports Direct’s boss Mike Ashley (a seeming unlikable character) was hauled before the Business Innovation and Skills Committee under accusations of abusive practices in their Derby Warehouse. With their treatment of staff being described as ‘Dickensian’ by some, the standards Sports Direct seemly employ clearly fall short of what British business is known for. Much is made of the abhorrent working standards commonly seen in the Far East and this is often cited as a reason to ‘Buy British’. However, when we uncover these similar practices on our own shores by well-known businesses, then one cannot help but feel damaged by it. 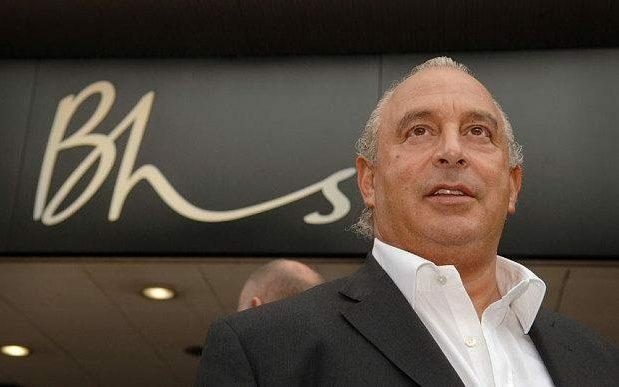 Then we have Sir Philip Green, who has been roasted by both the Work and Pensions and BIS Select Committees for his shameful mismanagement of, long-standing High Street stalwart, BHS. Once hailed as the ‘King of Retail’, Green’s fall from grace could not have been further. You cannot help but to consider how much thought the billionaire is genuinely giving to the 11,000 workers whose livelihoods are at risk and the 22,000 more pensioners whose future is up in the air. It perhaps seems now inevitable that Phillip Green will be judged by history alongside the likes of Robert Maxwell. Both of Ashley and Green represent the unacceptable face of capitalism but worse – they also represent Britain in an international business market. Brand Britain must be seen as one of our most valuable commodities and everyone that does business from the UK has a responsibly to uphold the standards we have become renowned for. Failure to do so further chips away at the brand of every British business. The British Family have a British made classic car… sort of. So we have recently invested in a British made car and I suspect you will be surprised by our choice. If I say that it is a much loved British classic, an undeniable an icon of UK motoring and regularly featured in TV and film your thoughts might immediately got to a Aston Martin DB8, a Jaguar E-Type or perhaps even a Lotus Elise. However, our sights were set somewhat lower. Yes – I am now the very proud owner of a MII Reliant Robin. At this point, dear reader, you might be thinking that I have lost my mind. This is indeed a view shared by Mrs B (who has adamantly said that she will not be seen dead in it) but there is method to the apparent madness. First things first, the Robin is not our main family car. The ‘plastic pig’ is admittedly not an ideal family run-around and it’s zero N-cap rating suggest that transporting a new baby might not be a wise move. But, it really is a lot of fun… and that’s the point. I have wanted one for years and recall a time when you could pick them up in good nick for around £300. Those days are long gone. Good/rare examples are now changing hands for as much as £8,000. Years of trike conversions and banger racing has meant that they are very much an appreciating classic. 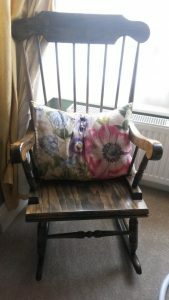 You might be glad to know that my example is neither in the extremely rare nor very good condition category and set me back a little over £1000. So, as a folly is it not a massive investment. So, why did I buy it? Well, being a biker with only a motorcycle licence it is the only car I can drive without going for a full driving licence- which, even to me, seems like a crazy loophole. I also wanted something that myself and Lucan can go on fun outing in and on this score the Robin is already paying dividends. My particular Mk2 Reliant Robin as built in Tamworth in 1994 featuring the second of 3 body shapes to over it’s over 30 year production run. It is the SLX model which was the higher spec-ed of the range when it was released. It has a 850cc engine, 4 seats and 3 doors under a completely fibreglass body shell. The engine is actually pretty pokey. Weighing less than 500kg it pulls away from the lights faster than most modern cars. The 4 speed gearbox is clean and precise but you need to be careful to change down on hills or you will eventually start rolling backwards. On one of the rare motorway jaunts in the car all I can say is that it got to 70MPH and (everso slightly) beyond with not struggle at all. It also felt very planted. The main question I have been asked about owning a Robin is “will it flip over”. The short answer is – no. The slightly longer answer is – if there are a unique set of circumstances where you are doing 50MPH around a hairpin bend on a 10% camber then possibly. Otherwise, it feels really stable. The SLX comes with cassette radio, heated rear windscreen and internal heater (powered by the heat of the engine). I might change the radio but I must say that it does the basics pretty well. The interior trim and overall quality of the plastics inside are pretty appalling. The wafer thin dash and door cards and dash are all let the experience down. The seats are tiny. In fact the whole drivers space is tiny. It requires you to put the key in the ignition and wind the window down before you get in as both of these tasks are difficult one in the drivers seat. Also, the pedals are really close together, which means that if you wear big boots you can be stepping on 2 peddles at the same time. It really is quite tight in there. Saying that though, the boot space (especially when the 2 back seats are down) is massive. I could get 2 full size bikes in there if pushed and still have space for the picnic basket. 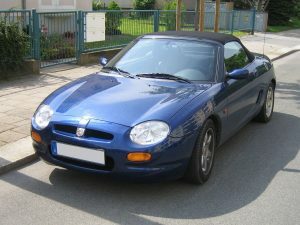 There is something about this car that perhaps no other car has, and that is a specific place in the British psyche. The Robin makes people smile, wave, run along side. People, after a few drinks, find it amusing to lift it up and put it on it’s roof. This has already happened to my Robin under my brief ownership. So, where next for the trusty Reliant? Well, me and a friend of mine are planning to drive the trusty Robin the length of Britain in August on a pilgrimage to the distilleries of Islay. The plan will be to video our adventures along the way and the results will be presented on this very site shortly after.